The last of the winter monsoon series is cancelled. The lane is pretty much blocked to vehicle traffic by lots of large logs and branches. It is going to take some effort to clear it. I got down to the club in wellies. 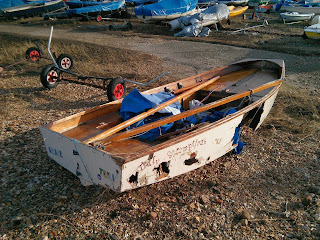 There is a green 420 dinghy which has become detached and is lying in the trees alongside the lane. About 100 metres from the club gate. It is floating but is uncovered. Only way to get to it is via the lake. Also a boat is submerged in the water in front of the old water ski club. Cannot tell make as can only see the top of the mast. Battered mirror wrecked by storm at Christchurch. Make them an offer pat ? Dave P and Dave I got the dinghy out and photographed the mayhem at RSC. We righted a some boats, shut up the ski shed doors and rescued some stray kit. Most boats are now tied to something, and the access to the river has been blocked, big thanks to Brian and Richard. Lots of water – up to our nether regions, so don’t attempt to wade up lane. No water in the clubhouse at all, hallelujua. Not surprisingly racing is cancelled. Not surprisingly the water level has risen, and the road through Sonning is now shut to vehicles. This raises the possibility of relocating the race to the B478 with use of the roundabout at Sonning Eye as a mark of the course – starboard rounding as per the highway code. The logistics of relocating would be significant therefore with regret RACING IS CANCELLED.